Fans can take their tailgate to the Joyride Pedal Pub during Talladega Superspeedway’s tripleheader motorsports weekend, April 26-28. Beginning Thursday (April 25) of race week, Joyride Pedal Pub will provide fans the opportunity to experience the track like never before. For 50 minutes, passengers can ride through the infield (must have proper credentials) or pedal around the outside property of the track with their friends and family. Fans can book a ride for $30 per person or $300 for private rental (minimum of six people, up to 15) and if booked in advance, guests receive $5 off per person when they book online. Infield rides are booked on the hour and run from 9 a.m. to 11 p.m. CDT (except Sunday, last one is 6 p.m.), while outside rides are booked on the half hour starting at 9:30 a.m. to 6:30 p.m. CDT each day. Joyride Pedal Pub will provide a cooler, cups, ice and a playlist for passengers to enjoy. All riders must be 18 years of age or older. For more information, meeting locations or to book a ride, visit joyrideus.com/tracks. 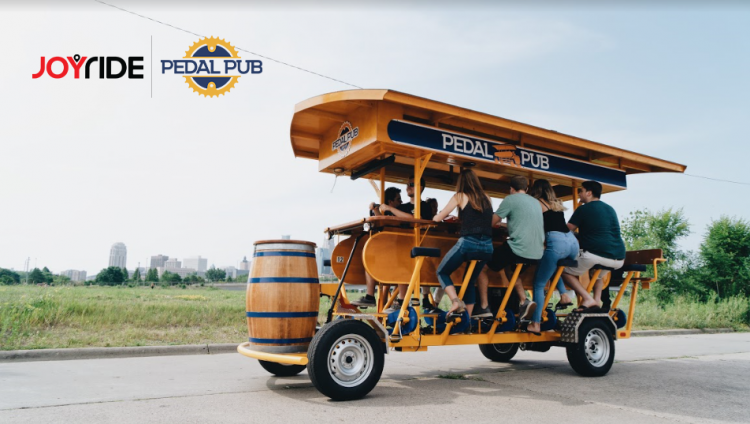 Need to hitch a ride to the designated Joyride Pedal Pub meeting location? Guests can utilize the incredible Joyride golf cart transportation service for a helpful lift around the mammoth 2.66-mile facility. Joyride golf carts will transport fans to and from almost anywhere around the track’s property (excluding GEICO West Park C). Joyride golf carts, which can seat up to five passengers, will run from 8 a.m. to midnight CDT each day starting Thursday through Sunday (April 28) of race week. Guests can catch a ride by calling (833) 654-RIDE (7443) or simply hailing down a cart, which will be specifically marked with the Joyride logo across the windshield. Each trip will cost a minimum tip of $5 (per person, per ride) and only cash will be accepted. In addition to the Joyride transportation program, NASCAR’s largest tri-oval will also continue to offer free tram and ADA shuttles free of charge throughout race weekend. For more information on the weekend and planning your trip, as well as ticket information, visit www.talladegasuperspeedway.com or call (855) 518-RACE (7223).